General Information | Zapovednik "Denezhkin Kamen"
Denezhkin Kamen State Nature Reserve covers 80,000 hectares in the north of Sverdlovsk region. It includes the entire Denezhkin Kamen massif, the eastern slopes of the Ural Mountains, the Khoza Tump range and the sources of the Ivdel, Taltia, Shegultan and Sosva rivers. Denezhkin Kamen Nature Reserve has many unique features. First, it's the only nature reserve located on the eastern side of the main Urals water divide. Secondly, as well as being home to a wide range of diverse species, it also represents several types of different ecosystems. Finally, its territory encompasses large segments of the tundra and the taiga (mountainous boreal coniferous forest). Both biomes serve as secure environments for unique, critical and endemic types of Urals mountain taiga flora and fauna. Despite the reserve's relative accessibility (there are several settlements distancing from 25 to 50 km from the border), there have never been any on-site industrial developments of its woodlands and mineral resources. There are no settlements or transport links anywhere in Denezhkin Kamen, and only a few small signs of human activity can be seen in a logged area near the boundaries and at a the former Solva gold mine. The territory enjoyed the protection of a state reserve from 1946 to 1961, and the reserve was re-established in 1991. 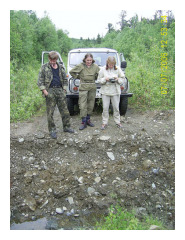 At that time, the new Denezhkin Kamen team continued in the spirit of its predecessors, and followed the path of conservation and research despite all the economic challenges of early post-Soviet period. Almost uniquely, Denezhkin Kamen even managed a new publication (“Nature Chronicles”) within a year of its official renaissance. Denezhkin Kamen State Nature Reserve was originally set up as part of the Ministry of Ecology’s Agency for Nature Preservation. When that agency was dissolved in 2000, it was placed under the jurisdiction of Ministry of Nature Resources and Ecology of the Russian Federation. The reserve administration is located in Severouralsk. It also has an administrative and research facility in Vsevolodo–Blagodatskoe. Denezhkin Kamen Reserve is a federal state–funded institution.